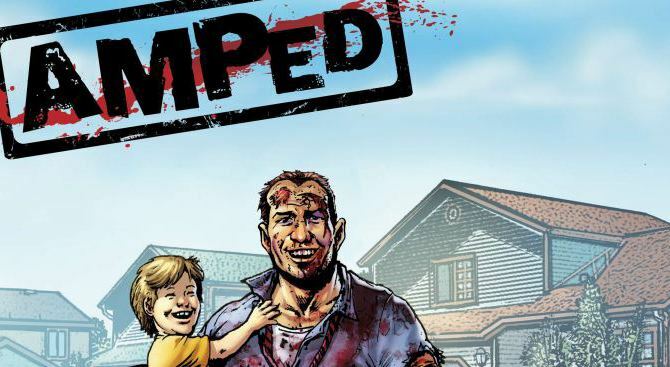 Coming this fall, Eric Kripke, best known for doing the campy Buffy-life horror show Supernatural, will be releasing a six-issue miniseries with Vertigo called “Amped.” The series will be a semi-realistic and ironic take on the superhero genre with the character buying a pill online to give him his powers, which are then used to jumpstart his dismal life. “Pretty much everything I’ve ever written has been insanely influenced by Vertigo, so it’s a dream come true to write my first comic there. ‘Amped’ is a project I’m foaming-at-the-mouth passionate about — and it’s also the most personal, warts-and-all story I’ve ever told. So I’m having the time of my life writing the comic — and basing the TV series off the comic, too. I can’t wait for readers to read it– and then down the road, for watchers to watch it,” says Kripke, about the project. Art will be by John Higgins, who is well known from popular work on Vertigo’s classic Hellblazer series. Warner Horizon television will also be bringing the characters and basic story to the small screen on the USA network almost simultaneously, which is something that is a great fit for Kripke. It is questionable how this series will play out since it seems to only be partially intended for comics, though there is nothing intrinsically bad about doing a two-medium simultaneous release. Kripke is an unproven name in the world of comics, and his cult-fare has done little to earn him respectibility. Hopefully this doesn’t continue the bad turn towards B-level television adaptations of Vertigo properties we have seen with shows like iZombie and Constantine.